How Can You Be Adventurous on A Budget? What is the first thought that pops into your mind when you hear the word “adventure”? Some of you might say things like touring Spain and Italy, visiting a new country, seeing Hagia Sophia in Istanbul. On the other hand, for many people, the word adventure is linked with affordability issues. Not everyone has the luxury to travel whenever they want. The constraints of our job and daily routine makes it a hard task for us to take even a slight bit of time off. However, you should be conscious of the fact that all work and no play will end up in frustration. You are not a machine that can function for a long time without requiring any break. Everyone has reached a point in time when he/she wants to let loose and to blow off some steam. Not every adventure calls for an out-of-country visit by spending a hefty amount of money on plane tickets, hotels, and tours. Some experiences can be enjoyed by just staying in your city. We have compiled for you the best three fun and affordable experiences that you can enjoy on a small budget. Adventures do not have to be swimming with the dolphins in Hawaii or African Safaris, the ideal way to have fun is to explore something new. Often, people take their city for granted, but to have an adventure on a budget, start from where you are by being a tourist in your town. Do a thorough Google search of the place you live and list down all the must-see tourist attractions. If you do not have a car then no problem, get a bicycle. Cycling is a hundred times better than driving, plus it has several health benefits too. Moreover, you won’t have to fret about parking your bike or getting stuck in traffic. Most bikes cost $1500-$2000 which obviously exceeds your budget. Don’t get disheartened because a Vilano Hybrid bike costs only $300. What a catch, right? Now you can just pedal your way to all the unvisited places in your city. Camping is also a great way to explore new things. Most people go camping because they are tired of the city life and want some time off. Find a good camping spot, and buy all the necessary camping gear such as a tent, an inflatable camping chair, first aid kid, sleeping bag, et cetera. Camping has countless health benefits, and the fresh air is good for your lungs. Surrounding yourself with nature can help in reducing stress. Plus, it is a perfect way to exercise and be active. So, switch off your cell phone and bask in the calmness of nature. This activity might have been on your bucket list for quite a while but the lack of time was holding you back from checking it off. Well, here is your chance. If you live near the shoreline or on an island, then scuba diving or snorkeling should be on the top of your list. 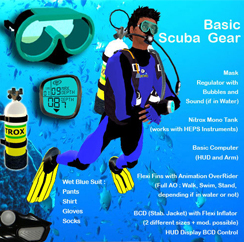 Start taking swimming lessons and get yourself registered in a scuba diving program. It is a relaxing and exciting sport, which has positive effects on your mind and body. The underwater experience will help you to clear your mind off the worries. It also prevents a person from depression, because the calm and profound breathing required for diving induces a peaceful state of mind. Scuba diving increases your blood circulation and reduces blood pressure. So, not only it is an excellent way to have fun, but it also has several therapeutic benefits.